Commonly referred to as either AdBlue or AUS32, Urea solutions are becoming more common place in the transport industry as companies seek to meet emissions targets and become 'greener' and more sustainable. Diesel Exhaust Fluids in the form of Urea Solutions blend 32.5% high purity Urea with 67.5% high purity deionized water to attain an aqueous solution. What are Urea solutions used for? These solutions are used in selective catalytic reduction to lower nitrogen oxide (NOx) emissions from diesel engines. NOx emissions are harmful pollutants and many companies are choosing to reduce their carbon footprints by installing Urea injectors in their diesel powered engines. How does Urea help lower NOx emissions? Diesel engines run at overstoichiometric air-to-fuel ratio to ensure the combustion of soot and prevent unburnt fuel from being emitted. This can lead to an excess of oxygen combustion which in turn can lead to the generation of increased NOx emissions. Urea solutions such as AdBlue are injected into the exhaust as it moves through diesel engines where it vaporizes and decomposes to form ammonia and carbon dioxide. The NOx is then catalytically reduced by the ammonia into water and nitrogen which are both harmless. This kit comes with a self priming membrane pump (without dynamic seal to reduce maintenance), Automatic stainless steel nozzle, nozzle mount, 6m delivery hose, 1.5m suction hose, hose tail and clamps, K24 flow meter. The kit is mounted on a stainless steel manifold. The manifold comes complete with hanger hooks and is extremely easy to use and move from tank to tank. 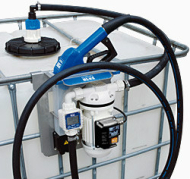 The kit is ideal for pumping from storage tanks such as IBC's (pictured) to vehicles etc. This kit is also available with out the flow meter and mounting bracket as a basic package. Up to 35LPM flow rate. 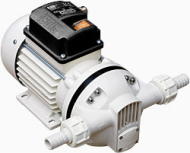 Easy to install via a mounting bracket, this pump is ideal for easy set up ready to go Urea solution transfer. 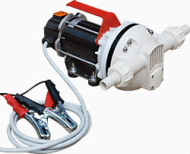 As per the picture this pump comes with carry handle, gator clips (electric 12 or 24 VDC). Up to 80LPM flow rate. We have more items such as dispensing reels and lines, nozzles, hand pumps etc. 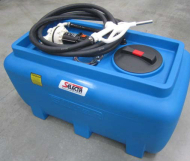 Ideal for farm use trucks and tractors this 200L urea solution mobile storage tank conveniently connects to vehicles power supply for use of the 12V self priming diaphragm pump. The Sebco 500 litre DEF Transportable Tank is designed for the easy transporation of Adblue and fits easily on the back of a wellside or flatdeck ute. All nuts and bolts are stainless steel, quality component throughout.